Connecting the developer community through conferences, user groups and training. What happened to my Salesforce System.Debug statements? If you just want to see the debug statements, simply log at the error level and then set everything else to none. 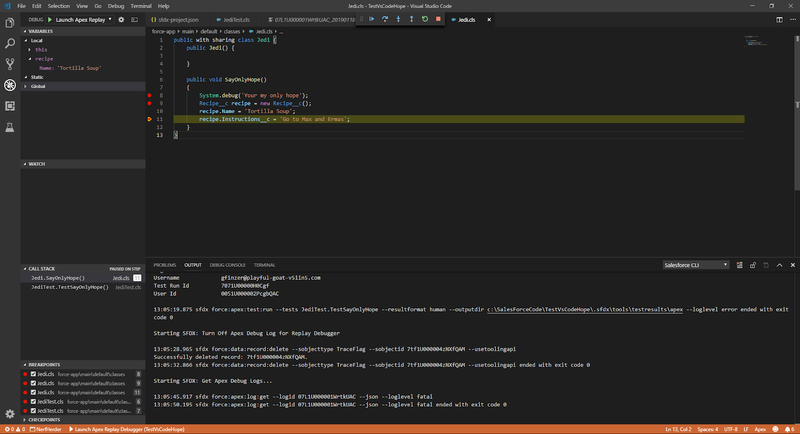 If you want to debug in Visual Studio at the Apex finest level, break your code up into small testable pieces so that you can pinpoint errors and the log files can be under the 5MB limit. The Single Responsibility should be your best friend when working in Salesforce. 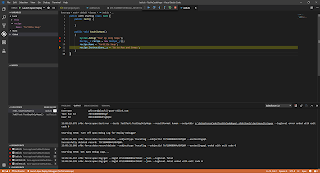 I have been working with the Salesforce Extension Pack for VS Code and I have been mostly pleased with the capabilities. On my current project, I find myself constantly switching between orgs. I was tired of typing in the command to list out the current org and the command to switch the current org. There is a great hotkey VS Code extension called terminal-command-keys that allows you to create a hotkey that executes a terminal command. The Salesforce CLI with hotkeys; what could be better! Add a command to switch to your development org. In my case, the alias is BossSand. Replace with the alias for your org. Add a command to switch to your test org. In my case the alias is BossStage. Replace with the alias for your org. Debugging in Salesforce is relatively new and it immature compared to debugging in Visual Studio or Eclipse. Even Microsoft Access has a better debugger than Salesforce. Essentially logs files are created when running tests and then the log files are used to step through the code. It is after the fact debugging, you cannot change the path that the code has gone. Make sure that you have pulled all your code and tests down from source control or from your org. These are step by step instructions to get VS Code working with Salesforce. Go to your Sandbox, under Setup search for Dev Hub. Enable Dev Hub and GA. This will allow you to create scratch orgs. Install the Salesforce Extension Pack. In VS Code, click the extensions icon and search for Salesforce Extension Pack. If your Salesforce code is in your org and not in source control then you are in Classic Development and not Salesforce DX. "In the .NET Framework 3.5 and earlier versions, ASP.NET provided an in-memory cache implementation in the System.Web.Caching namespace. In previous versions of the .NET Framework, caching was available only in the System.Web namespace and therefore required a dependency on ASP.NET classes. In the .NET Framework 4, the System.Runtime.Caching namespace contains APIs that are designed for both Web and non-Web applications." Here are a couple methods to Load and Save from the Memory Cache. If the value is not found, it will be null. The function can be passed in that will fill the data if it does not exist in the cache. Christian, .net developer, entrepreneur, dad, and lover of popcorn. To understand recursion, you must first understand recursion. . Picture Window theme. Theme images by enot-poloskun. Powered by Blogger.